This time of year it seems nearly impossible to keep the a cold or the flu from rearing it's their ugly heads, in one form or another. We can certainly do our best however, to keep the bugs at bay and keep our immunity in tip top shape. 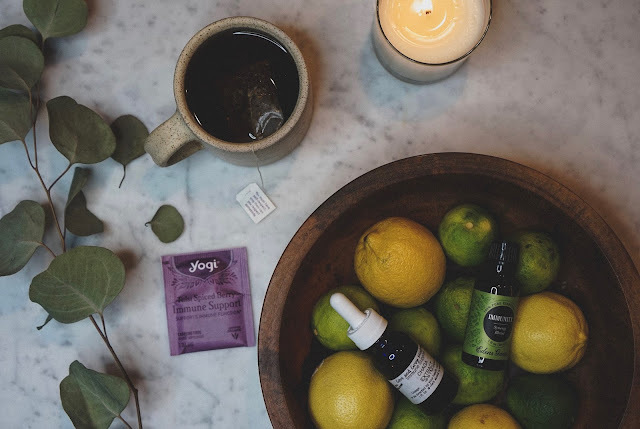 Over the years I've acquired an arsenal of natural tricks and remedies to fight off whatever winter might have in store, no flu shot necessary! Below are some of my favorite (and easiest) answers to preventing and eliminating sickness during cold and flu season. I first was introduced to Chaga mushrooms at Be Well Lifestyle Cafe, where they make the delicious/nutritious/cold kicking Chaga Tonic. Their blend of Chaga tea, ACV, fresh ginger juice, cinnamon and cayenne is sure to help build immunity and eliminate any cold you may be fighting. After trying their concoction, I was curious to learn more about Chaga mushrooms and their benefits. Turns out these little 'shrooms are pretty magical after all! Chaga mushrooms are touted to not only boost immunity, but also fight inflammation in the body, fight viruses, increase endurance and even inhibit cancer progression. Amazing! I now take a sublingual Chaga extract every day. I get mine from local mushroom producer, Give and Grow Mushrooms (find them at Eastern Market). I also like the Chaga tea sachets from Buddah Teas. 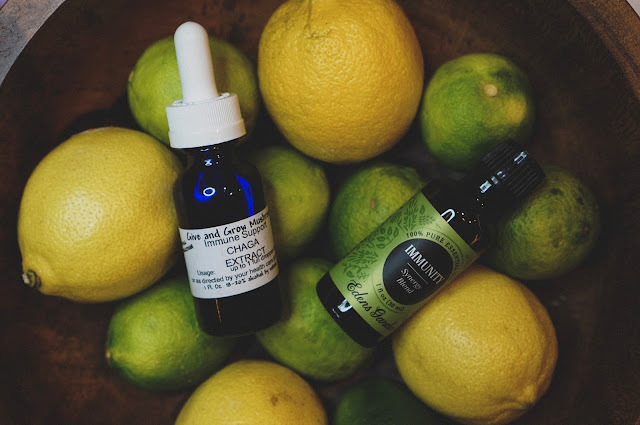 Essential Oils seem to be everywhere these days, but for good reason! They really are so effective for a myriad of treatments. I love to use Eden's Garden Immunity Blend during the winter months. I diffuse it every night at bedtime, as well as apply it to the bottoms of my feet and lower back, for added immune support. Additionally, I always keep a roller bottle of a 10% dilution in my purse to use at work through the day. I really love supporting Eden's Garden, as they are a small, female owned company that provides affordable access to extremely high quality oils. They support small farmers, that use sustainable, eco friendly farming practices, yet may be too small to receive (the extremely costly and labor intensive) USDA Organic certification. You can read more about their mission here! Along with maintaining a healthy diet in general, it is important to boost vitamin C intake during cold and flu season especially. I try and start every day with a hot water with lemon, as well as my everyday green smoothie, which contains citrus as well. Several cells in the immune system require vitamin C to function properly (and thus protect us from sickness) so it is crucial we consume adequate levels. I like to insure that my vitamin C intake is bio-available (meaning your body can actually use it), which is why I prefer to consume whole food sources, like citrus, versus taking a man-made supplement. Herbal teas are great for a few reasons. First, hydration is important during all seasons, but can be can be easier to forget during the winter months when cold water can be so unappealing. Hot herbal tea is not only hydrating, but also comforting as it warms the body. There are so many great immune support blends available. Lately I have been drinking Yogi Tulsi Spice Berry Immune Support. 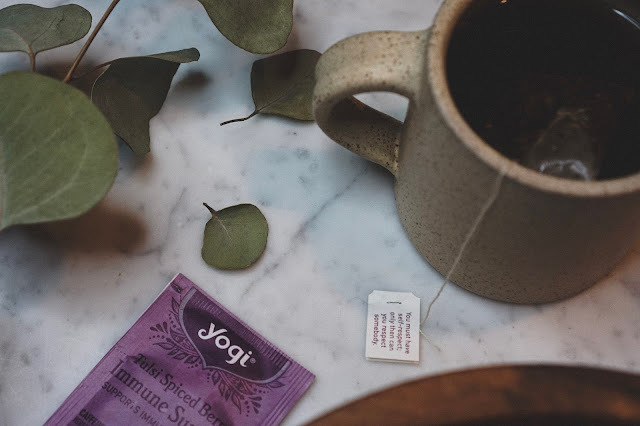 This blend tastes great, and also combines herbs such as Tulsi Leaf and Elderberry to supply antioxidants to the body and naturally support immune function. Human TNF has been purified to apparent homogeneity as a 17.3-kilodalton protein from HL-60 leukemia cells and has showed cytotoxic and cytostatic activities against various human tumor cell lines. The human TNF cDNA is 1585 base pairs in length and encodes a protein of 233 amino acids. The mature protein begins at residue 77, leaving a long leader sequence of 76 amino acids. TNF-alpha has been mapped to human chromosome 6.